Fig. 1 Forest disturbance driver. (A) Reference disturbance driver for each sampled pixel. (B) National estimates of 2000-2014 forest loss area by disturbance driver. Figure from Tyukavina et al. (2018). 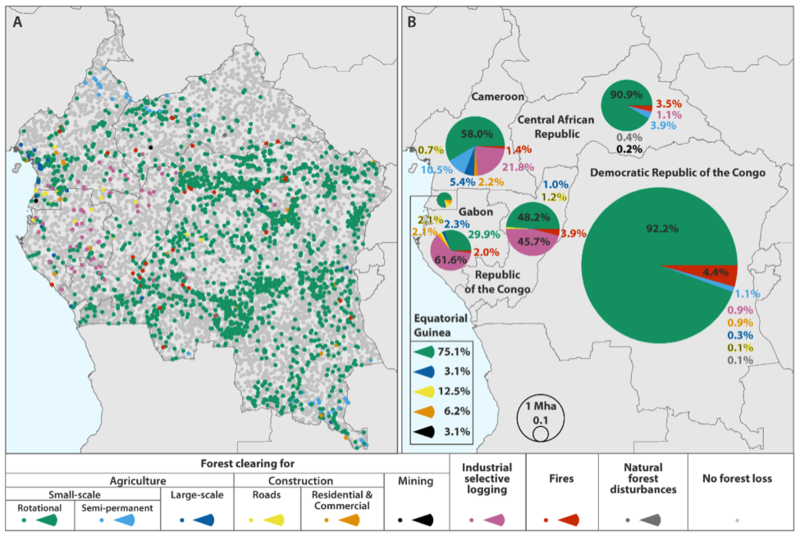 A regional assessment of forest disturbance dynamics from 2000 to 2014 was performed for the Congo Basin countries using time-series satellite data. Area of forest loss was estimated and disaggregated by predisturbance forest type and direct disturbance driver. An estimated 84% of forest disturbance area in the region is due to small-scale, nonmechanized forest clearing for agriculture. Annual rates of small-scale clearing for agriculture in primary forests and woodlands doubled between 2000 and 2014, mirroring increasing population growth. Smallholder clearing in the Democratic Republic of the Congo alone accounted for nearly two-thirds of total forest loss in the basin. Selective logging is the second most significant disturbance driver, contributing roughly 10% of regional gross forest disturbance area and more than 60% of disturbance area in Gabon. Forest loss due to agro-industrial clearing along the Gulf of Guinea coast more than doubled in the last half of the study period. Maintaining natural forest cover in the Congo Basin into the future will be challenged by an expected fivefold population growth by 2100 and allocation of industrial timber harvesting and large-scale agricultural development inside remaining old-growth forests.